W.Kay. With the Author’s Kind Wishes, Sept 26th 1930. Note. 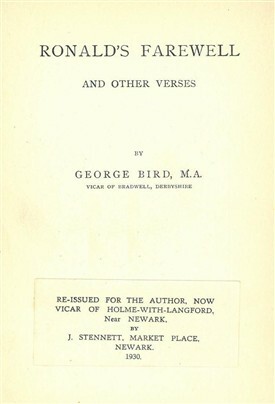 It had been my intention to publish this volume of verse some years ago in my Wife’s lifetime; and it was dedicated to her in this particular poem. Now that her death has intervened, and I can only inscribe this book to her dear memory, I print these dedicatory verses just as they were originally written, when they won her sweet approval. 8. Probate, England, Nottingham, Nottinghamshire 1927/08/09. England & Wales, National Probate Calendar (Index of Wills & Administrations) 1858-1966. www.ancestry.co.uk – accessed 13 Feb 2015. 9. 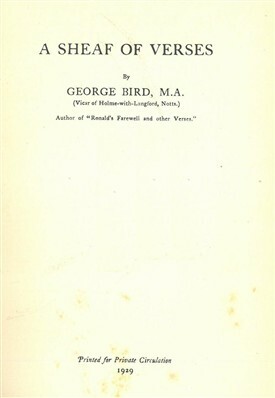 Ronald’s Farewell and other verses 1901. www.barterbooks.co.uk – accessed 13 Feb 2015. This page was added by Website Administrator on 15/04/2015.